Implementation of trading algorithms often requires analyzing data from various external sources, including Internet. MQL5 provides the WebRequest function for sending HTTP requests to the "outside world", but, unfortunately, it has one noticeable drawback. The function is synchronous meaning it blocks the EA operation for the entire duration of a request execution. For each EA, MetaTrader 5 allocates a single thread that sequentially executes the existing API function calls in the code, as well as incoming event handlers (such as ticks, depth of market changes in BookEvent, timer, trading operations, chart events, etc.). Only one code fragment is executed at a time, while all remaining "tasks" wait for their turn in queues, till the current fragment returns control to the kernel. But for the sake of simplification, the manager and the auxiliary EA can be implemented in the form of the same code (program). One of the two roles of such a "universal" EA - a manager or an assistant - will be determined by the priority law. The first instance launched declares itself a manager, opens auxiliary charts and launches a specified number of itself in the role of assistants. What exactly and how should the client, the manager and the assistants pass to each other? To understand this, let's analyze the WebRequest function. As you know, MetaTrader 5 features two options of the WebRequest function. We will consider the second one to be the most universal. The names and prototypes of the functions are conditional. In fact, we need to pass this information between different MQL programs. Normal function calls are not suitable for this. To let MQL programs "communicate" with each other, MetaTrader 5 has the custom events exchange system we are going to use. Event exchange is performed based on a receiver ID using ChartID — it is unique for each chart. There may only be one EA on a chart, but there is no such limitation in case of indicators. This means a user should make sure that each chart contains no more than one indicator communicating with the manager. In order for the data exchange to work, you need to pack all "function" parameters into the user event parameters. Both request parameters and results can contain fairly large amounts of information that do not physically fit into into the limited scope of events. For example, even if we decide to pass the HTTP method and the URL in the sparam string event parameter, limiting the length to 63 characters would be an obstacle in most working cases. This means that an event exchange system needs to be supplemented with some kind of shared data repository, and only links to records in this repository should be sent in the event parameters. Fortunately, MetaTrader 5 provides such storage in the form of custom resources. In fact, resources dynamically created from MQL are always images. But an image is a container of binary information, where you can write anything you want. To simplify the task, we will use a ready-made solution for writing and reading arbitrary data into user resources — classes from Resource.mqh and ResourceData.mqh developed by a member of the MQL5 community fxsaber. The provided link leads to a source — the TradeTransactions library is not related to the current article's subject, but the discussion (in Russian) contains an example of data storage and exchange via the resources. Since the library can change, and also for the convenience of readers, all the files used in the article are attached below, but their versions correspond to the time of writing the article and may differ from the current versions provided via the link above. Besides, mentioned resource classes use yet another library in their work — TypeToBytes. Its version is also attached to the article. We do not need to delve into the internal structure of these auxiliary classes. The main thing is that we can rely on the ready-made RESOURCEDATA class as a “black box” and use its constructor and a couple of functions suitable for us. We will look at this in more detail later. Now, let's elaborate on the overall concept. The client and the assistant can delete their local resources. Results can be passed more efficiently on steps 5 and 6 due to the fact that the assistant EA sends the result directly to the client window bypassing the manager. 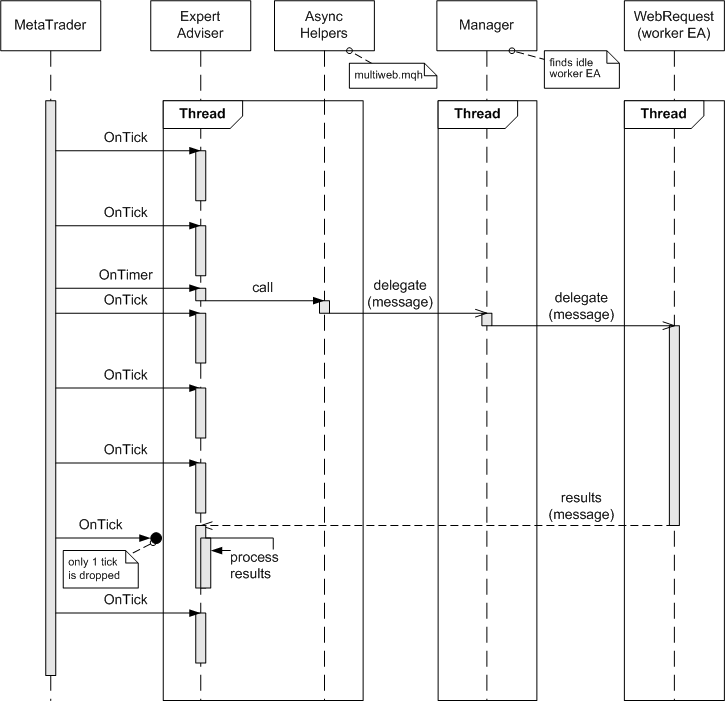 The steps described above are related to the main stage of processing HTTP requests. 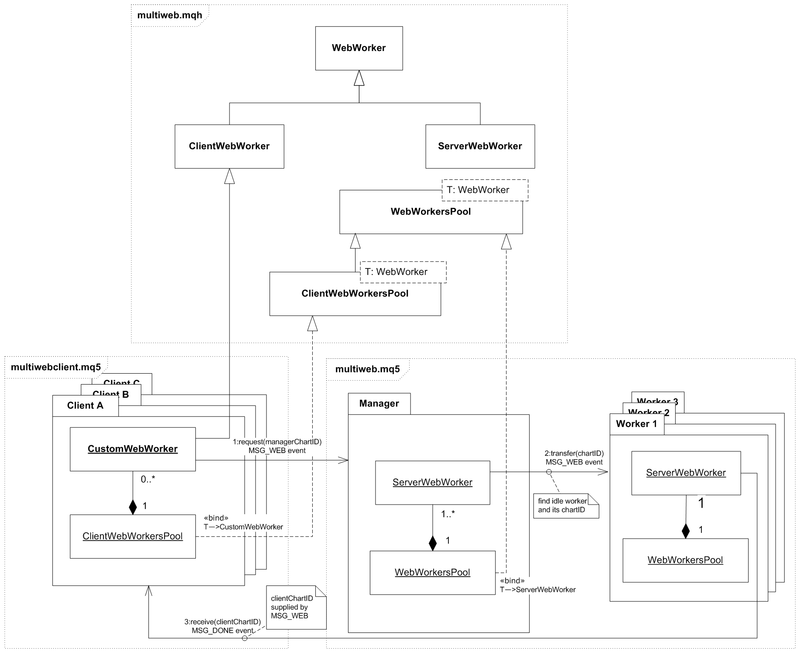 Now, it is time to describe linking disparate parts into a single architecture. It also partially relies on user events. The central link of the architecture — the manager — is supposed to be launched manually. You should do it only once. Like any other running EA, it automatically recovers together with the chart after the terminal restarts. The terminal allows only one web request manager. The manager creates the required number of auxiliary windows (to be set in the settings) and launches instances of themselves in them that “find out” about their assistant status thanks to the special “protocol” (details are in the implementation section). Any assistant informs the manager of its closing with the help of a special event. This is necessary to maintain a relevant list of available assistants in the manager. Similarly, the manager notifies assistants of its closing. In turn, the assistants stop working and close their windows. The assistants are of no use without the manager, while re-launching the manager inevitably re-creates the assistants (for example, if you change the number of assistants in the settings). Windows for assistants, like the auxiliary EAs themselves, are always supposed to be created automatically from the manager, and therefore our program should “clean them up”. Do not launch the assistant EA manually — inputs that do not correspond with the manager status are considered an error by the program. During its launch, the client MQL program should survey the terminal window for the presence of the manager using bulk messaging and specifying its ChartID in the parameter. The manager (if found) should return the ID of its window to the client. After that, the client and the manager can exchange messages. These are the main features. It is time to move on to implementation. 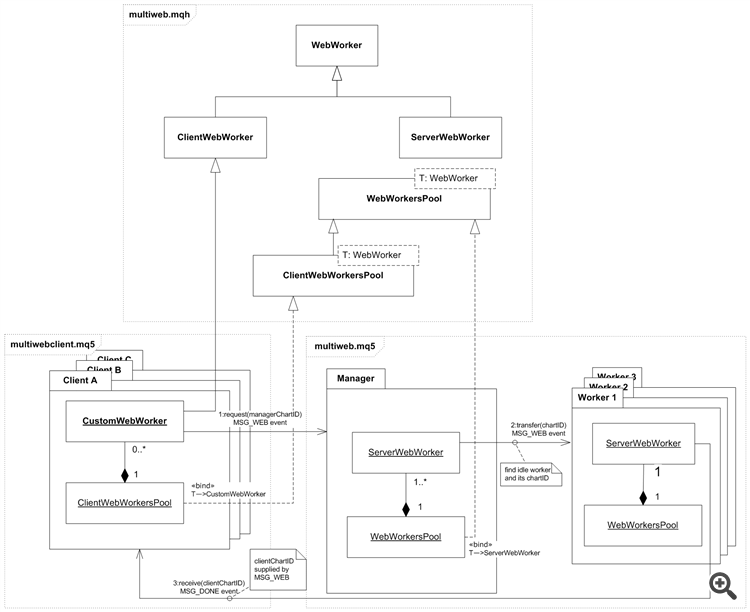 To simplify the development, create a single multiweb.mqh header file where we describe all the classes: some of them are common for the client and "servers", while others are inherited and specific for each of these roles. Let's start from the class storing resources, IDs and variables of each element. Instances of classes derived from it will be used in the manager, in the assistants and in the client. In the client and in the assistants, such objects are needed primarily to store the resources "passed by the link". Beside this, note that several instances were created in the client to execute multiple web requests simultaneously. Therefore, the analysis of the current requests' status (at least of whether an object is already busy or not) should be used on the clients to the full extent. In the manager, these objects are used to implement identification and tracking the assistants' status. Below is the base class. prefix — unique prefix for each status; a prefix is used in the names of resources. In a particular client, it is recommended to make a unique settings as shown below. Assistant EAs use the "WRR_" (abbreviated from Web Request Result) prefix by default. The 'allocate' method to be used in derived classes. It creates an object of the RESOURCEDATA<uchar> type resource in the 'resource' variable. The chart ID is also used in naming the resource, together with the prefix. The resource can be released using the 'release' method. The getFullName method should be mentioned in particular, since it returns the full resource name, which includes the current MQL program name and directory path. The full name is used to access third-party program resources (for reading only). For example, if the multiweb.mq5 EA is located in MQL5\Experts and launched on the chart with the ID 129912254742671346, the resource in it receives the full name "\Experts\multiweb.ex5::WRR_129912254742671346". We will pass such strings to resources as a link using the sparam string parameter of custom events. The broadcastEvent static method, which sends messages to all windows, will be used in the future to find the manager. To work with a request and an associated resource in the client program, we define the ClientWebWorker class derived from WebWorker (hereinafter the code is abbreviated, the full versions are in the attached files). First of all, note that the 'request' method is an actual implementation of step 1 described above. Here a web request is sent to the manager. The method declaration follows the prototype of hypothetical WebRequestAsync. The receiveResult static method performs the reverse action from step 7. As the 'resname' first input, it receives the full name of the external resource in which the request results are stored, while the 'initiator', 'headers' and 'text' byte arrays are to be filled within the method with data unpacked from the resource. What is 'initiator'? The answer is very simple. Since all our "calls" are now asynchronous (and the order of their execution is not guaranteed), we should be able to match the result with the previously sent request. Therefore, the assistance EAs pack the full name of the source client resource used to initiate the request into their response resource together with data obtained from the Internet. After unpacking, the name gets into the 'initiator' parameter and can be used to associate the result with the corresponding request. The receiveResult method is static, since it uses no object variables — all results are returned to the calling code via the parameters. Both methods contain ellipses where packing and unpacking data to and from resources are required. This will be considered in the next section. We can pass this name (supplemented by the program name as a prefix) in custom events, so that other MQL programs are able to access the same resource. Please note that all other programs, except the one within which the resource was created, have read-only access. where 'array' is a kind of an array we have to prepare. Here, 'array' is an output parameter where the original array contents is placed. Now let's turn to the application aspect of using resources to pass data about HTTP requests and their results. We are going to create a layer class between resources and the main code - ResourceMediator. The class is to pack the 'method', 'url', 'headers', 'timeout' and 'data' parameters to the 'array' byte array and then write to the resource on the client's side. On the server side, it is to unpack the parameters from the resource. Similarly, this class will package the server-side 'result' and 'result_headers' parameters into the 'array' byte array and write to the resource to read it as an array and unpack it on the client side. The ResourceMediator constructor accepts the pointer to the RESOURCEDATA resource, which will then be processed inside the methods. In addition, ResourceMediator contains supporting structures for storing meta information about data. Indeed, when packing and unpacking resources, we need a certain header containing the sizes of all the fields in addition to the data itself. For example, if we simply use the StringToCharArray function to convert a URL into an array of bytes, then when performing the inverse operation using CharArrayToString, we need to set the array length. Otherwise, not only URL bytes but also the header field following them will be read from the array. As you may remember, we store all data in a single array before witing to the resource. Meta info about the length of the fields should also be converted into a sequence of bytes. We apply unions for that. The reverse operation of retrieving request parameters from the resource is performed in the unpackRequest method. Here the main work is performed by the string calling resource.Get(array). Then, the meta data bytes, as well as all subsequent fields based on them, are read from the 'array' step by step. Request execution results are packed and unpacked a similar way using the packResponse and unpackResponse methods (the full code is attached below). Now we can go back to the ClientWebWorker source code and complete the 'request' and 'receiveResult' methods. They are quite simple due to the ResourceMediator class taking over all the routine work. The remaining questions are who and when calls the WebWorker methods, as well as how we can get the values of some utility parameters, such as managerChartID, in the 'request' method. Although I am slightly running ahead, I recommend allocating the management of all WebWorker classes objects to more high-level classes that would support actual object lists and exchange messages between programs "on behalf" of the objects including the manager search messages. But before we move to this new level, it is necessary to complete a similar preparation for the "server" part. Let's declare the custom derivative from WebWorker to handle asynchronous requests on the "server" (manager) side, just like the ClientWebWorker class does that on the client side. The 'transfer' method delegates handling a request to a certain instance of an assistant EA according to step 2 in the overall interaction sequence. The resname parameter is a resource name obtained from a client, while clientChartID is a client window ID. We obtain all these parameters from custom events. The custom events themselves, including MSG_WEB, are described below. The 'receive' method creates a local resource in the WebWorker current object ('allocate' call) and writes the name of an original request initiator resource there, as well as data obtained from the Internet (result) and HTTP headers (result_headers) using the 'mediator' object of the ResourceMediator class. This is a part of step 5 of the overall sequence. So, we have defined the WebWorker classes for both the client and the "server". In both cases, these objects will most likely be created in large quantities. For example, one client can download several documents at once, while on the manager’s side, it is initially desirable to distribute a sufficient number of assistants, since requests may come from many clients simultaneously. Let's define the WebWorkersPool base class for arranging the object array. Let's make it a template, because the type of stored objects will differ on the client and on the “server” (ClientWebWorker and ServerWebWorker, respectively). The idea behind the methods is simple. The constructor and destructor allocate and free the array of specified size handlers. The group of findWorker and getIdleWorker methods searches for objects in the array by various criteria. The 'operator<<' operator allows adding objects dynamically, while the 'revoke' method allows removing them dynamically. The pool of handlers on the client side should have some specificity (in particular, with regard to event handling). Therefore, we extend the base class using the derived ClientWebWorkersPool one. name — common prefix for resources in all pool objects. In the ClientWebWorkersPool constructor, we see the call of WebWorker::broadcastEvent(TO_MSG(MSG_DISCOVER), ChartID()) that sends the MSG_DISCOVER event to all windows passing the ID of the current window in the event parameter. MSG_DISCOVER is a reserved value: it should be defined at the beginning of the same header file together with other types of messages the programs are to exchange. The comments mark the direction a message is sent in. The TO_MSG macro is designed for transforming the listed IDs into real event codes relative to a random user-selected base value. We will receive it via the MessageBroadcast input. This approach allows moving all events into any free range by changing the base value. Note that custom events can be used in the terminal by other programs as well. Therefore, it is important to avoid collisions. The MessageBroadcast input will appear in all of our MQL programs featuring the multiweb.mqh file, i.e. in the clients and in the manager. Specify the same MessageBroadcast value when launching the manager and the clients. Here CHARTEVENT_CUSTOM is a beginning of the range for all custom events in the terminal. As we can see, the onChartEvent method in ClientWebWorkersPool handles some of the messages mentioned above. For example, the manager should respond with the message MSG_HELLO to the MSG_DISCOVER bulk messaging. In this case, the manager window ID is passed in the lparam parameter, while the number of available assistants is passed in the dparam parameter. When the manager is detected, the pool fills the empty 'workers' array with real objects of the required type. The current window ID, as well as the unique resource name in each object is passed to the object constructor. The latter consists of the common 'name' prefix and the serial number in the array. MSG_WEB is a message about executing a web request. After receiving it, the manager should find a free assistant EA and pass the client resource name (sparam) to it with the request parameters, as well as the chartID (lparam) client window ID. We already know the 'release' method — it releases the resource that is not needed already. What is onResult? If we look at the full source code, we will see that the ClientWebWorker class features two virtual functions without implementation: onResult and onError. This makes the class abstract. The client code should describe its derived class from ClientWebWorker and provide implementation. The names of the methods imply that onResult is called if the results are successfully received, while onError is called in case of an error. This provides feedback between the working classes of asynchronous requests and the client program code that uses them. In other words, the client program does not need to know anything about the messages the kernel uses internally: all interactions of the client code with the developed API are performed by the MQL5 OOP built-in tools. Let's look at the client source code (multiwebclient.mq5). Besides, we need to create a pool of request handler objects (ClientWebWorkersPool) in OnInit. But in order to do this, we need to describe our class derived from ClientWebWorker. Its only objective is to log status and obtained data. Now we can create a pool of such objects in OnInit. As you can see, the pool is parametrized by the MyClientWebWorker class which makes it possible to create our objects from the library code. The array size is selected equal to the number of entered addresses. This is reasonable for demonstration purposes: a smaller number would mean a processing queue and discrediting the idea of parallel execution, while a larger number would be a waste of resources. In real projects, the pool size does not have to be equal to the number of tasks, but this requires additional algorithmic binding. The prefix for resources is set as a combination of the name of the working symbol and the chart period. Check if the manager is present in the timer handler. Display an alert if connection is not established. Do not forget to remove the pool object in the OnDeinit handler. All events, except for CHARTEVENT_CLICK, are sent to the pool where the appropriate actions are performed based on the analysis of the applied events' codes (the onChartEvent fragment was provided above). The full code of the example is a bit lengthier since it also features the logic for calculating the execution time and comparing it with a sequential call of the standard WebRequest for the same set of addresses. We have finally reached the "server" part. Since the basic mechanisms have already been implemented inthe header file, the code of managers and assistants is not as cumbersome as one might imagine. WebRequestPoolSize is a number of auxiliary windows the manager should create to launch assistants on them. ManagerChartID is a manager window ID. This parameter is usable only as an assistant and is filled with the manager when assistants are launched from the source code automatically. Filling ManagerChartID manually when launching the manager is treated as an error. The 'manager' logical flag indicates the role of the current EA instance. The 'pool' variable is an array of handler objects of incoming tasks. WebWorkersPool is typified by the ServerWebWorker class described above. The array is not initialized in advance because its filling depends on the role. The first launched instance (defined in OnInit) receives the manager role. The EA checks the presence of a special global variable of the terminal. If it is absent, the EA assigns itself the manager and creates such a global variable. If the variable is already present, then so is the manager, and therefore this instance becomes an assistant. Please note that the global variable is temporary, which means it is not saved when the terminal is restarted. But if the manager is left on any chart, it creates the variable again. In case of an assistant role, yet another ServerWebWorker handler object is simply added to the array. The manager case is more complicated and is arranged in the separate instantiateWorkers function. Let's have a look at it. This function uses the Expert third-party library developed by our old friend - member of MQL5 community fxsaber, therefore a corresponding header file has been added at the beginning of the source code. The Expert library allows you to dynamically generate tpl templates with specified EAs' parameters and apply them to specified charts, which leads to the launch of EAs. In our case, the parameters of all assistant EAs are the same, so their list is generated once before creating a specified number of windows. The parameter 0 specifies the path to the executable EA file, i.e. to itself. Parameter 1 is WebRequestPoolSize. It is equal to 1 at each assistant. As I have already mentioned, the handler object is needed in the assistant only for storing a resource with HTTP request results. Each assistant handles the request by a blocking WebRequest, i.e. only one handler object is used at most. Parameter 2 — ManagerChartID manager window ID. Parameter 3 — basic value for message codes (MessageBroadcast parameter is taken from multiweb.mqh). Further on, empty charts are created in the loop with the help of ChartOpen and assistant EAs are launched in them using EXPERT::Run (chart, Params). 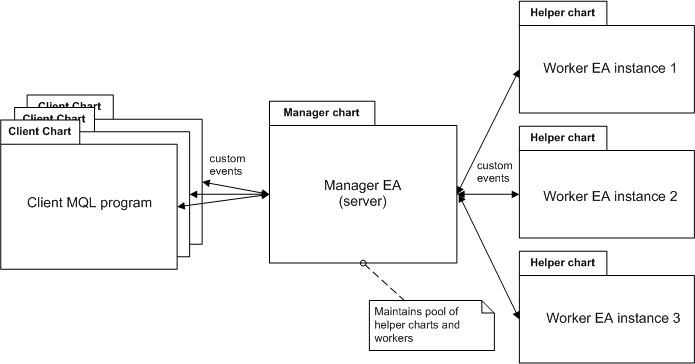 The ServerWebWorker(chart) handler object is created for each new window and added to the pool. In the manager, the handler objects are nothing more than links to assistants' window IDs and their status, since HTTP requests are not executed in the manager itself and no resources are created for them. Incoming tasks are handled based on user events in OnChartEvent. First of all, as a response to MSG_DISCOVER obtained from the client with the lparam ID, the manager returns the MSG_HELLO message containing its window ID. Upon receiving MSG_WEB, lparam should contain the window ID of the client that sent the request, while sparam should contain a name of the resource with packed request parameters. Working as the manager, the code tries to pass the task with these parameters to an idle assistant by calling the 'transfer' function (described below) and thereby change the status of the selected object to "busy". If there are no idle assistants, the MSG_ERROR event is sent to the client with the ERROR_NO_IDLE_WORKER code. Assistant executes the HTTP request in the startWebRequest function. The MSG_DONE event arrives to the manager from the assistant when the latter uploads the requested document. The manager finds the appropriate object by assistant ID in lparam and disables its "busy" status by calling the 'release' method. As already mentioned, the assistant sends the results of its operation directly to the client. The full source code also contains the MSG_DEINIT event closely related to OnDeinit handling. The idea is that the assistants are notified of the manager removal and, in response, unload themselves and close their window, while the manager is notified of the removal of the assistant and deletes it from the manager's pool. I believe, you can get an understanding of this mechanism on your own. The 'transfer' function searches for a free object and calls its 'transfer' method (discussed above). By using ResourceMediator, the function unpacks request parameters and calls the standard MQL WebRequest function. If the function is executed without MQL errors, the results are sent to the client. To do that, they are packed into a local resource using the 'receive' method (described above), and its name is passed with the MSG_DONE message in the sparam parameter of the EventChartCustom function. Note that HTTP errors (for example, invalid page 404 or web server error 501) fall here as well — the client receives the HTTP code in the dparam parameter and response HTTP headers in the resource allowing you to analyze the situation. If WebRequest call ends with an MQL error, the client receives MSG_ERROR message with the ERROR_MQL_WEB_REQUEST code, while GetLastError result is placed to dparam. Since the local resource is not filled in this case, the name of a source resource is passed directly in the sparam parameter, so that a certain instance of a handler object with a resource can still be identified on the client side. Testing the implemented software complex can be performed as follows. First, open the terminal settings and specify all servers to be accessed in the list of allowed URLs on the Experts tab. Next, launch the multiweb EA and set 3 assistants in the inputs. As a result, 3 new windows are opened featuring the same multiweb EA launched in a different role. The EA role is displayed in the comment in the upper left corner of the window. Now, let's launch the multiwebclient client EA on another chart and click on the chart once. With the default settings, it initiates 3 parallel web requests and writes diagnostics to the log, including the size of the obtained data and the running time. If the TestSyncRequests special parameter is left 'true', sequential requests of the same pages are executed using the standard WebRequest in addition to parallel web requests via the manager. This is done to compare execution speeds of the two options. As a rule, the parallel processing is several times faster than the sequential one - from sqrt(N) to N, where N is a number of available assistants. The sample log is displayed below. 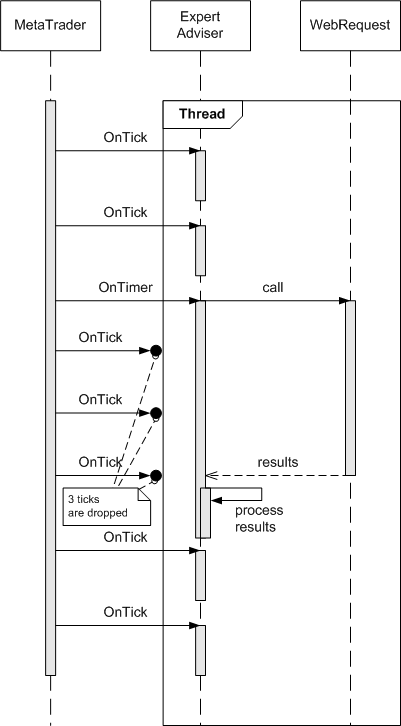 Note that the total execution time of all requests is equal to the execution time of the slowest one. If we set the number of assistants to one in the manager, requests are handled sequentially. In this article, we have considered a number of classes and ready-made EAs for executing HTTP requests in non-blocking mode. This allows obtaining data from the Internet in several parallel threads and increasing the efficiency of EAs which, in addition to HTTP requests, should perform analytical calculations in real time. In addition, this library can also be used in indicators where the standard WebRequest is prohibited. To implement the entire architecture, we had to use a wide range of MQL features: passing user events, creating resources, opening windows dynamically and running EAs on them. At the time of writing, the creation of auxiliary windows for launching assistant EAs is the only option for paralleling HTTP requests, but MetaQuotes plans to develop special background MQL programs. The MQL5/Services folder is already reserved for such services. When this technology appears in the terminal, this library can probably be improved by replacing auxiliary windows with services. Nice article, thanks. How about WinINet Asynchronous mode? I don't have plans to implement such a thing, sorry. In the Russian discussion of the article one may find further investigation of the approach and an alternative implementation based on chart objects. Обсуждение статьи "Многопоточный асинхронный WebRequest на MQL5 своими руками"
An object is created for each request, an expert assistant is created in it, and at the end of the request, the object is deleted. The exchange of query data and results, as in the article, is done through resources. I'm attaching the sources here as well. Also please check for updated versions of include files from fxsaber, which are used in dependencies - they may contain bugfixes and speedups.